Following his uncle, Dr. Paul Molloy developed an early interest in chiropractic care and knew as a teenager that he wanted to be a chiropractor. 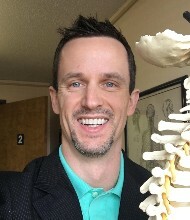 He holds a Bachelor of Arts degree from SUNY Oswego and a Doctor Of Chiropractic Degree from New York Chiropractic College. Before making the quality of life choice that brought him to New Hampshire, Dr. Molloy practiced in a Connecticut medical and chiropractic center. A native of Cambridge, New York, Dr. Molloy is an avid snowboarder and hiker.